Parents care about their children. I care for mine. That is why my children are immunised. With immunisation uptake in Northern Queensland for 1-5 year old between 92 and 95%, I don’t often meet parents who decline to immunise their children. In our modern society we are mostly detached from life threatening complications of common vaccine preventable illnesses. It was our great-grandparents generation who were more used to seeing small children dying from diphtheria, tetanus, or measles. Most Australian have no fear of smallpox or polio because we don’t see these illnesses anymore in our community. This edition of Ockham’s Razor talked about the early attempts to control infectious disease in Australia. Only a small percentage of parents out rightly declined to vaccinate their children. Others have heard the charismatic social media gurus, fear adverse effects, mistrust the motives of government and the influence of pharmaceutical companies. There are who those who don’t wish to engage in a discussion, and those who are hesitant about making a commitment to immunise. I would like to think as a GP, I have time to explore concerns and provide information that may provide reassurance. I have put together this post to enable a more informed discussion and open the door to immunisation. Here is a link to three video resources which I have found helpful. The Australian Academy of Science produced this document in 2016 to help to improve community understanding of the principles of immunisations. This addresses the science, safety and efficacy of immunisations. “Immunisation Myths and Realities” is another useful resource. It helps to address certain questions raised by those who are opposed to immunisations. Another Australian resource on vaccine safety is Are vaccines safe? Many studies have been completed which investigated the link measles, mumps and rubella vaccination and thiomersal to autism. The good thing about these studies is that the data show no relationship between vaccines and autism. The Autism Science Foundation has an extensive list of resources. I hope this takes away the hesitancy. One morning recently, I was alerted to a not so agile wallaby laying on a nearby road. A fresh road kill from overnight. These creatures, graze on urban lawns and as from the pictures below are generally doing well, as is my lawn. Animals like small children aren’t able to recognize the risk from that moving box heading towards them, or they simply don’t look. 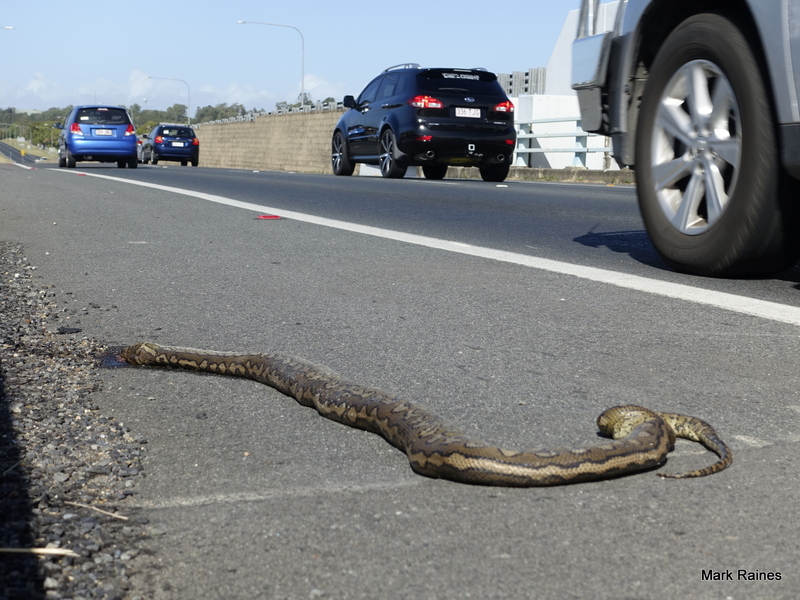 Each year in Australia many thousands of collisions occur between animals and motor vehicles, resulting in massive loss of animal life, vehicle repair costs and injury or death to drivers or passengers. There is however, no ambulance service for the animal. There is no vet or paramedic who rushes in to put in two large IV cannula, a chest tube, to start cardiopulmonary resuscitation, apply a pelvic binder, given analgesia and maybe a bag of blood, and scoop off to hospital for emergency care and surgery. Thankfully, there are groups like WIRES who provide care for some of these injured animals. Generally, no one intentionally runs down an animal crossing the road. There are of course exceptions, this young man who ended up being arrested and justly charge with animal cruelty. Following a collision, you may have to face the time needed for healing of injuries and the cost of vehicle repairs. The cost to vehicles alone has been estimated by an Australian insurer to be around $21 million annually. 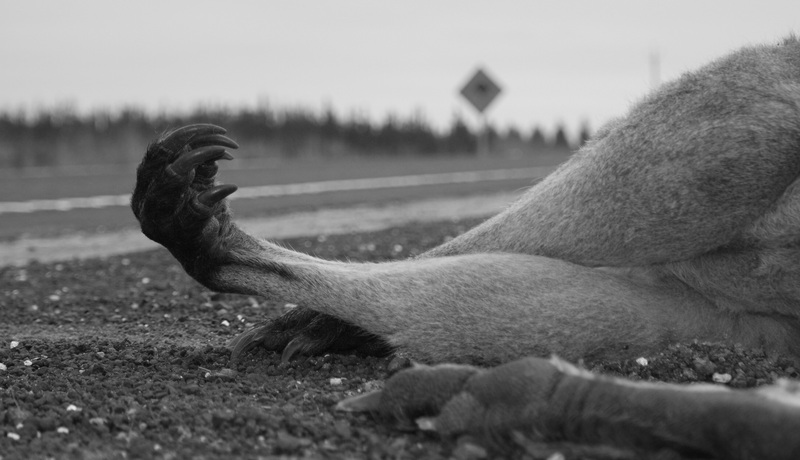 Rowden et al in Road crashes involving animals in Australia shows that wallabies and kangaroos make up almost 45% of all road kill. These authors also discuss various counter measures including ultrasonic repellents and note there is little evidence for efficacy. Helena Bender did her Phd Thesis on such equipment if you would like more detailed reading. 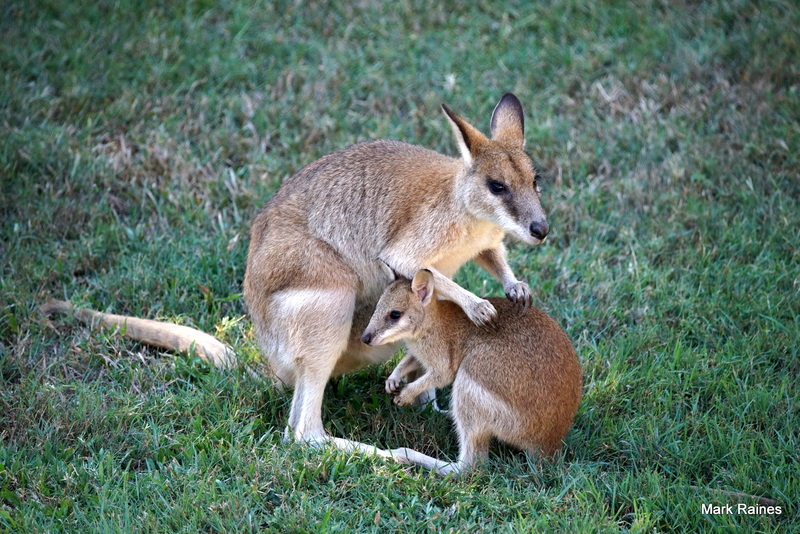 Apparently, a sound akin to a thumping kangaroo thump may make a better deterrent. 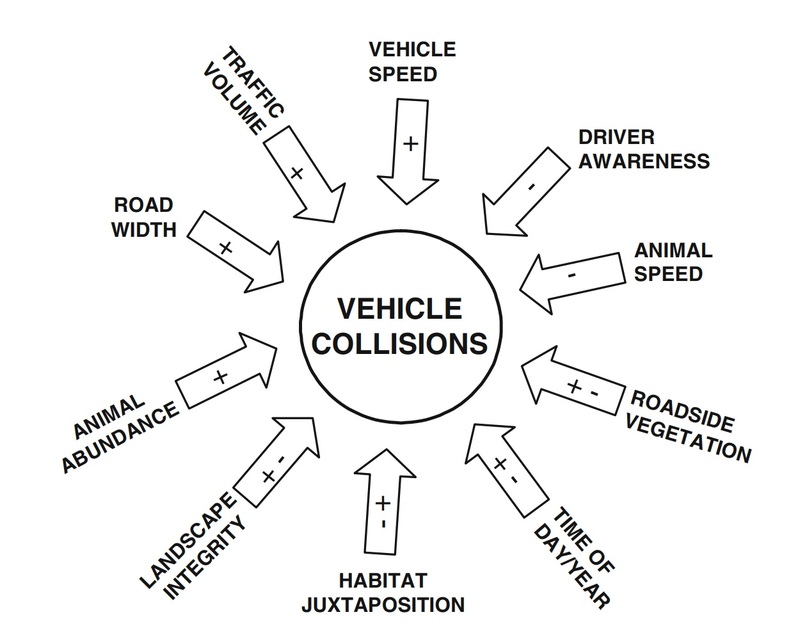 This diagram shows many of the interrelated factors that contribute to animal and vehicle collisions. Roads by their very nature are hazardous to creatures. They divide native population ranges, act to funnel animals towards hazards, and water run off leads to greener vegetation and better grazing opportunities. Food discarded by drivers attracts animals, and ultimately, an injured or killed animal may attract carrion feedings. 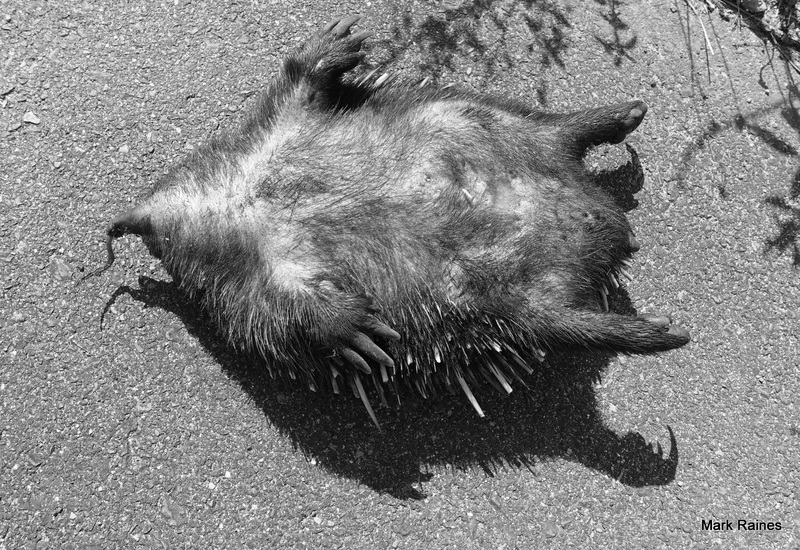 As reported by the Guardian, Tasmania has recently launched a roadkill campaign to reduce 500,000 native animal deaths. Research from Tasmania suggests that dropping the speed from 100 to 80 km/hr at specific black spots, may reduce animal casualties by 50%, whilst only adding 3 minutes to a journey from Launceston to Hobart. Here is a very interesting infographic on animal victims with statistics from 2012 notes casualty figures amongst Tasmanian creatures, for example 3392 Tasmanian devils per year. 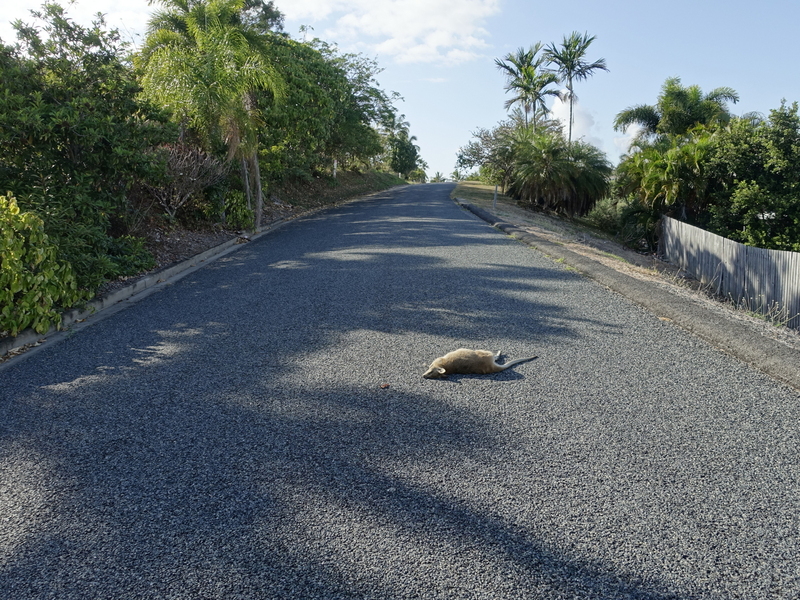 Taylor and Goldingay in a 2010 paper entitled Roads and wildlife: impacts, mitigation and implications for wildlife management in Australia discuss how far Australia is lagging in protecting it’s native fauna against carnage on the roads. Speed limits are one thing but infrastructure such as under and overpasses may well save animal lives. 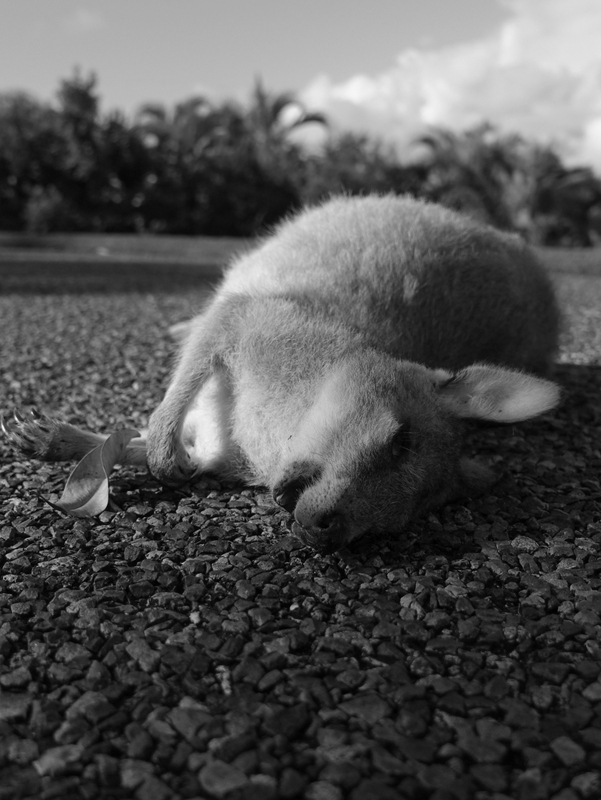 This article from a Singapore newspaper highlights the hazards to Australian animals and visitors; warns of outback roads littered by roadkill. Intuition back up science by showing under drought conditions, more kangaroos appear alongside roads. Lee et al showed that kangaroo density increases 10 fold alongside roads with resulting increase in vehicle impact. Night time, corners and fences were all factors in accidents. In some species, they found more victims to be male, which place more pressure on populations. To me, better lighting, slower speeds seem to be sensible options to reduce fatalities and vehicle injuries. Of course, you could just apply a herbicide or predator scents up along the road verge but Australia is a big country. 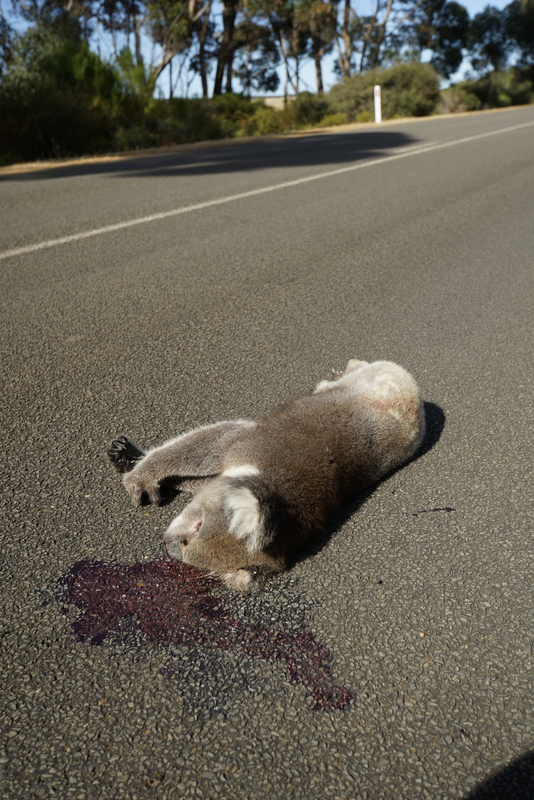 Australia is not alone with road kill problems. In New Zealand, introduced possums litter the side of the roads. I gave up counting on one road trip. Some of course would suggest that this is not such a bad thing for an introduced species. In Canada it is moose, deer, bison, beer and foxes. In Africa, it includes all the zoo favourites such as lions, cheetahs and zebras and even elephants! I have in my 30 years of driving all over Australia, accidentally collided with just two kangaroos, a cow, one dog, several birds (not emus) and no humans. My first occasion to hit a kangaroo was driving in a battered HQ station wagon to Coral Bay in Western Australia in 1985. This happened on a night where there was hundreds of kangaroos abounding. The unfortunate macropod dived into my only working headlight making the remainder of the journey quite slow using my parking lights. The second in a Pajero, on Kangaroo island, happened in steady rain with hindsight I was driving too fast for the conditions. The cow collision as driving back to Port Hedland from Newman on a very dark night. I had just dipped my high beam for oncoming traffic, when it’s rear-end appeared in from of me. I wasn’t hurt but the WA Health Nissan Pintara was totalled. I also have a friend who has published this book on how to prepare and present road kill for consumption. The office of the coroner dates from approximately the 12th century under the English judicial system. In its early years, the coroner’s duties were mainly administrative. The coroner kept the king’s records, and collected revenue. Over the years the role expanded to include investigating deaths. If a person was found dead the coroner was notified and a jury was assembled where the jury examined the body. Evidence was heard and the jury’s verdict taken. If a verdict of murder or manslaughter was returned the coroner seized his property for the king. For a discussion of the the early history of the coroner, this article by Charles Gross is informative. In Australia, the Coroner’s jurisdiction has been in place since the foundation of the NSW colony. In his commission of 2 April 1787 Governor Phillip was granted power to ‘constitute and appoint Justices of the Peace, Coroners Constable and other necessary officers’. The earliest recorded inquest in New South Wales dates from 1796 in which three magistrates including Samuel Marsden inquired into the death of a convict who had been shot. 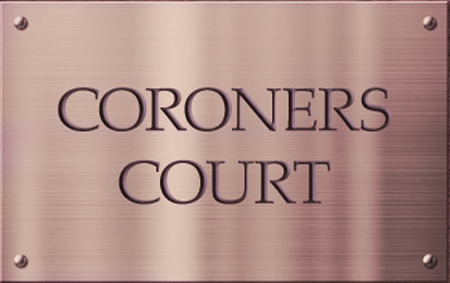 Today, a Coroner investigates a death in order to determine the identity of the deceased and the date, place, circumstances and medical cause of death. It is stated that the Coroner’s role is to find out what happened, not to point the finger or lay blame. 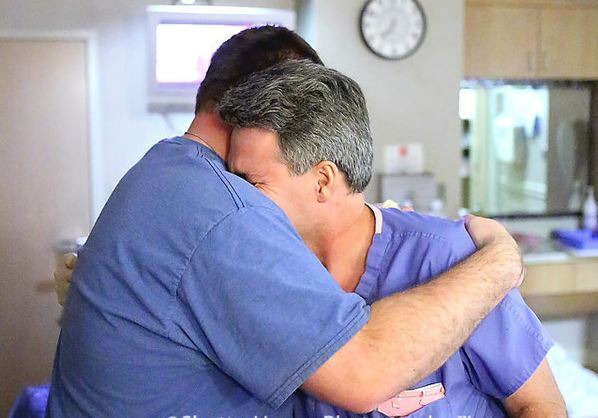 To assist a Coroner will call upon experts in the field, police, and witnesses, including doctors and nurses who may have been involved in a deceased person’s care. Importantly, not all people who die are investigated by the Coroner. And sometimes findings are not disclosed to the general public. The Coroner after deliberation will makes recommendations to prevent the same think happening again, that is to avoid a preventable death. In the past I have seen arguments about how impractical some of these recommendations are. For example, one Coroner suggested GP’s should not prescribe fentanyl, which was an interesting statement to make when an non-GP had prescribed the medication that lead to the person’s death. Some reports are more controversial than others. Newspapers have the habit of summarising a Coroner’s report to sell a story, so journalist’s reports should never relied upon to make an opinion without reading the original report. The Inquest into the death of Hamid Khazaei recently completed by the Queensland Coroner, Terry Ryan provides so much more than what can be gleaned from various newspapers. As there is a delay between death and the Coroner’s recommendation, the media may speculate all sorts of stories. A Coroner report can provide closure to family and friends of the dead person. I have been involved in the death of a number of patients whilst working within the hospital system and had to present evidence to the Coroner in one case. That information is all on public record. Back in October 2002, a man fell from his bed in hospital and died shortly afterwards from a massive intracranial haemorrhage. I was the intern on the team looking after him on that final admission. Reading back through the Coroner’s report today, I can see essentially how all the holes in the Swiss cheese lined up which lead to a preventable death. To ensure that the as many as possible are informed of coroner recommendations, many reports are available for reading. Of course, some of these reports pertain to deaths due to violence, misadventure and have no medical staff intervention at all. If you have an interest, here are the links to public Coroner reports. The Clinical Communiqué is an electronic publication containing narrative case reports about lessons learned from Coroners’ investigations into preventable deaths in acute hospital and community settings. The Clinical Communiqué is written, edited, published and distributed by the Department of Forensic Medicine, Monash University and the Victorian Institute of Forensic Medicine. Oh no another acronym change! Technically non-invasive prenatal testing aka NIPT was always a misnomer as a needle into your arm is still invasive. Now it seems we need to get used to cell free DNA testing or cfDNA. Again technically the test is done on circulating cell-free fetal DNA which is really ccffDNA, but lets keep it shorter. 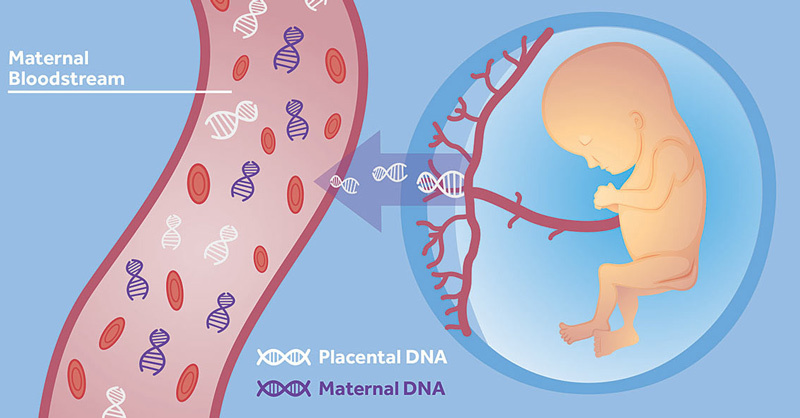 An important consideration is most of the DNA comes from dead placental cells which means a discordant NIPT oops cfDNA, may arise with mosaicism. For a great update on what this tests and what it does have a look at this ANZJOG paper published this month. first trimester ultrasound has benefits in addition to aneuploidy detection, including confirmation of dates, viability, number of fetuses and detection of structural anomalies. Although many women will have an ultrasound prior to paying for the cfDNA test to ensure accurate dates. meta‐analysis has shown procedure‐related miscarriage risks following invasive as 0.11% (one in 909) for amniocentesis and 0.22% (one in 454) for chorionic villus sampling. If doing an invasive test, I would always ask the doctor doing it what their own rates are. Cost for the basic NIPT/cfDNA test do vary a little but have become a lot less expensive since they were introduced into Australia. The expanded tests for each of these assessing gender and microdeletion etc, obviously cost more. None offer a money back guarantee for errors in gender assessment! Some offer a free retest if fetal fraction is too low and no result can be give. The cost of a cfDNA is however a considerable expense for many patient. For example, Lisa Hui has has shown that over 90% of referrals for an NIPT in 2013 were from private practice. Susan Maxwell in an editorial in the ANZJOG has called for consideration of public funding for NIP/cfDNA testing. MBS provides a subsidy for maternal serum screening and combined first trimester screening as well as invasive prenatal diagnostic procedures and karyotyping. Although, as many families may discover there may be a considerable gap to these tests too. I do wonder given there are 300,000 successful pregnancies in Australia each year, what cost the various pathology labs would charge if there was public funding available. Economy of scales that work for pizza should provide a more equitable solution to providing a better quality test to Australian families. You may be surprised but you probably do not need an X-ray, CT scan, or MRI for acute back pain. There are some good reasons for this. The image obtained is the end results of how various tissues absorb radiation to prevent passage of the radiation to a detector. An x-ray provides a two dimensional image from a flat film. Although, now a digital detector is used rather than wet chemistry, just like photography. The radiographer positions you and the machine up to takes the image, whilst a radiologist is a doctor who interprets the image. A CT or computed tomography scan, makes use of computer-processed combinations of many x-ray measurements taken from different angles to produce cross-sectional (tomographic) images. Hence, you lie down in a machine that looks like a giant donut. The virtual slice of your body are in reproduced in various shades of grey depending again on how much the tissue absorbed the radiation. Some illness or injury will affect the degree of absorption of the radiation affecting the final image. CT scans, through more computerised processing can be reconstructed in a 3-D image of parts of the human body. Here is a link to Radiopedia’s page on what a normal CT and x-ray of the lumbar spine looks like. There are no published studies that prove a direct link between medical imaging and increased cancer risk. The assumed increased risk of cancer from CT scans and x-rays is based on individuals exposed to high doses due to atomic bombs and nuclear accidents. Things have moved on from the early days of x-rays such as shown in the illustration where both doctor and patient are receiving a massive dose of radiation. This article talks about some of the early injuries from x-rays. 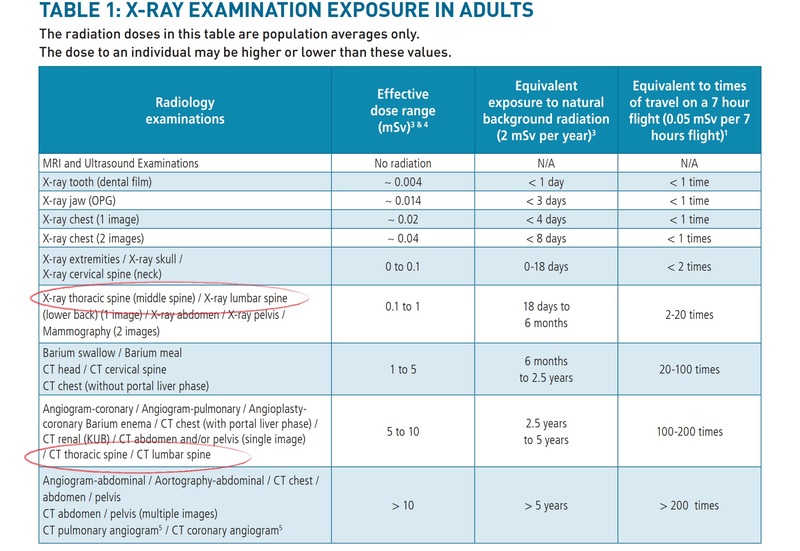 Here is a table that shows the relative amount of radiation required for various x-ray and CT scans. Radiation exposure is measured in millisieverts or mSv. The average radiation dose to a person in Australia from natural sources is about 1-2mSv per year. There are calculators used to determine the risk from a radiological study. So for a lumbar spine x-ray series I would receive a dose of 1.5 mSv of radiation, which is equivalent to back ground radiation I am exposed to over a whole year. MRI or magnetic resonance imagining uses strong electromagnets and radiowaves to make water molecules move in a specific way. The information collected at a detector then enables computers to build up an image on internal structures in thin slices. An MRI allows a better image of soft tissues, hence it is more useful than x-rays and CT-scans to view nerves, ligaments and intraverbral discs. There may be no radiation risk from an MRI, but it is not without physical hazards; it can be difficult to tolerate the tunnel if you are claustrophobic, it would be wise not to be in the way of metals objects being attracted to the magnets, and movement or heating of metallic implants can cause tissue damage, and pigments in tattoos can cause burns. Here is a link to Radiopedia that shows a normal MRI of the lumbar spine. Here is the Medicare rebate for three studies of the lumbar spine. Of course the cost to you may include a gap set by the radiology practice. It may pay to shop around. Remember, you pay not only for the quality of the scan, but also the radiologist’s interpretation of what may be wrong. l have to confess that I have NOT done five year of training to be a fellow of the Royal Australian and New Zealand College of Radiologists, and so am not be the best person to interpret an MRI done by “MRI R US”. As mentioned above, a radiologist will interpret the x-ray or scan to answer a clinical question posed to them. 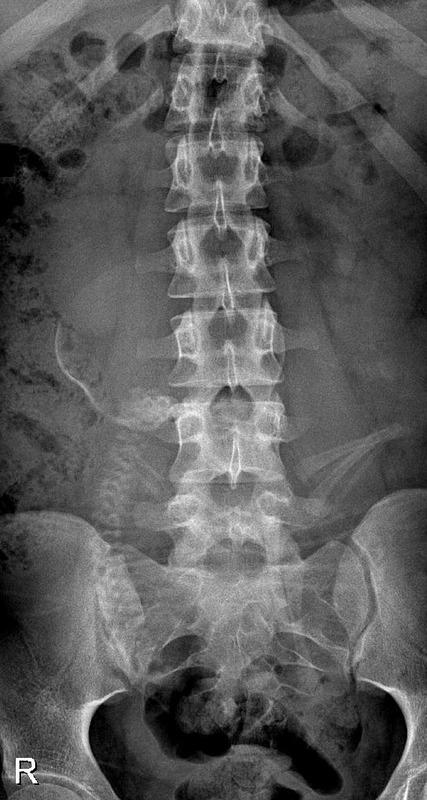 Hopefully it will more than “what is the cause of this chaps back pain?” An incidentaloma is a shadow that is seen that represents a lesion of dubious or uncertain clinical significance. This may leads to increased anxiety on the part of the doctor or the patient and may well lead to more scanning, extra tests, surgery or a biopsy to find out if the spot is of clinical significance. In some cases, it may be a “lucky” find such as a resectable pancreatic cancer, but more often is just a distraction. Sometimes, incidental findings can be quite enlightening. In this case from Radiopedia, the patient did not know about the pregnancy. Two months later she gave birth to a healthy child. As suggested by this review paper, “these imaging findings must be interpreted in the context of the patient’s clinical condition”. Low back pain is common in Australia, affecting over two-thirds of adults at some point in their lifetime. Findings such as disc degeneration, facet hypertrophy, and disc protrusion are often interpreted as causes of back pain, triggering medical and surgical interventions in the hope of alleviating suffering. Sometimes, this does works, but for some it doesn’t, leaving a person worse off after surgery, addicted to opiate pain relievers, believing that they will never get better. Several studies have demonstrated that imaging findings of spinal degeneration are present in a large proportion of asymptomatic individuals. 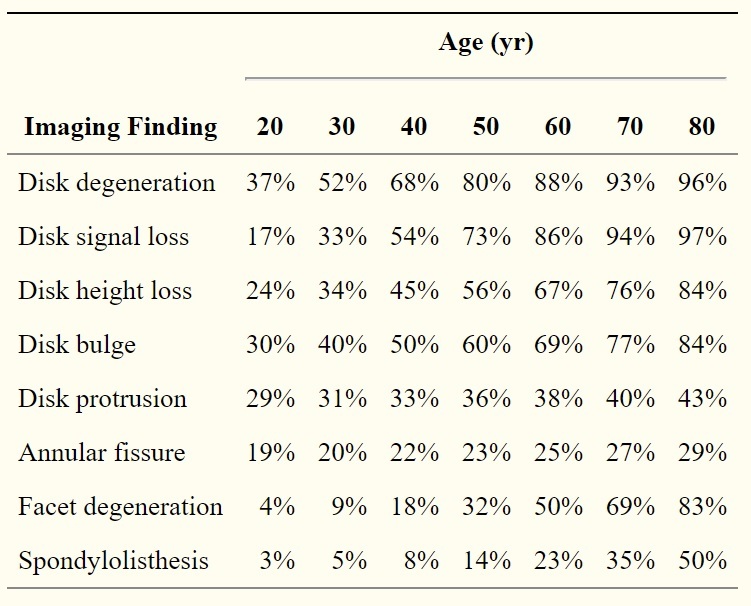 I have taken this table from a 2016 paper in the American Journal of Neuroradiology that studied the age-specific prevalence of the following imaging findings in asymptomatic individuals: disk degeneration, disk signal loss, disk height loss, disk bulge, disk protrusion, annular fissures, facet degeneration, and spondylolisthesis. You can see that as you age, a scan is more likely to pick up abnormal findings. But even in a 20 year old, a third of people scanned had a disc bulge which is often blamed for that annoying sciatica. So are there times when I may consider imaging? Indeed there are things which may increase the the chance of finding an significant abnormality which may indicate a scan. These are often clumped together as red flags and may indicate the four serious causes that is cancer, infection, a fracture or spinal cord damage (cauda equina). This then leads your doctor to consider a serious of questions that at first may seem odd and not connected before going on to examine your back. Blood tests that suggest infection , eg elevated ESR or CRP. Recent trauma should raise the vertebral fracture, in patients who are over 50 years old and especially in those over 70 years old. The presence of both recent trauma and an age of over >50 years carries a 13.1% probability of a vertebral fracture and 20.5% probability of vertebral fracture in an over 70 years. The presence of a history of cancer in the setting of low back pain carries a 10.6% probability of having a spinal malignancy. A history of unintentional weight loss, alone, carries a 3% probability of having a spinal infection; however, when both red flag were present, the probability of having a spinal malignancy was 14.3%. A recent history of infection in the setting low back pain carries a 10.2% probability of having a spinal infection. A history of fever, chills, or sweating, alone, carries a 2% probability of having a spinal infection; however, when both red flag questions were present, the probability of having an infection in the setting of low back pain was 13.8%. A loss of bladder control and loss of bowel control has a the probability of having cauda equina syndrome of 1.2%. Classically, night pain has been associated with malignancy and infection; however, this symptom was a false positive >85% of the time for malignancy, and >96% of the time for infection when no other associated red flag symptoms were present. Other than an age of >50 years and a diagnosis of vertebral fracture, the absence of any individual red flag or combination of red flags does not help to rule out a particular red flag diagnosis, as noted by the low change in probabilities, sensitivities, and negative likelihood ratio of red flag questions. So back to the original request for an x-ray, CT or MRI, it is therefore not unreasonable to suggest that imaging the back is of such low yield that you are better off being reassured that your back pain is likely to be self-limited and benign.